This week’s debate is about a fashion question I have asked myself for years! Are gold and silver jewelry ok to mix? I always had an issue with it and stayed away until I jumped on the Alex and Ani bandwagon. My husband bought me and adorable gold owl and I had a silver one already and a silver one I had ordered on the way. The point being, when you are just starting your Alex and Ani collection, if you have three you better wear all three or it doesn’t have that adorable stacked bracelet look. I have now gotten used to the gold and silver mix on my wrist but it is very subtle. Well today, I read that the mix is actually considered one of the top Fashion Accessory trends for Fall 2016! To take it a step further, a lot of accessories come with mixed metals, no mixing on your part needed. We see it a lot in bracelets because the stacked trend has continued to stick around and mixing metals gives a bit of added dimension and drama. However, this look can be included in any of your accessories which may include, necklaces, purse hardware, earrings, rings, etc. 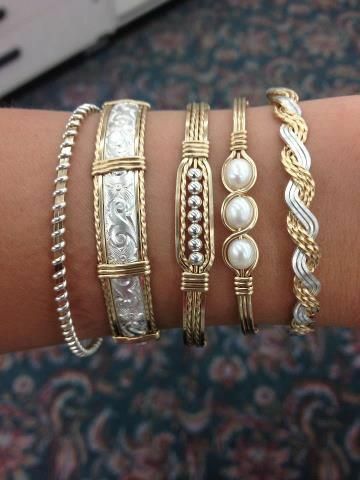 How do you feel about mixed metals? Let us know your opinion on the matter! This entry was tagged fashion, jewelry, Trends. Bookmark the permalink.